Peaceful student protesters display "the very best of Baltimore"
BALTIMORE -- While images of burning buildings and shattered windows dominated headlines and TV coverage during the peak of the Baltimore riots, a pair of young activists were busy staging the city's biggest peaceful protests - an effort that the mayor's office called the "very best of Baltimore." Korey Johnson, a 19-year-old junior at Towson University, and John Gillespie Jr. organized the separate marches of high school and college students at Penn Station and City Hall. Thousands of students walked through the streets of West Baltimore, peacefully demanding justice for Freddie Gray, the black man who suffered a fatal spinal injury in police custody. The protests will continue following Baltimore's top prosecutor announcement that the six officers involved in Gray's arrest face criminal charges. "Until the riots, Towson University students didn't know what was happening in Baltimore," Gillespie told CBS News. "There had been peaceful protests for about eight days." Johnson said the presence of a militarized troops in the city unnerved many protesters but did not deter her resolve. "It's important to understand the root cause of the issue at hand, the conditions that facilitated students doing this in the first place," Johnson said. "Police called in the National Guard, it's scary. ... but I think it's bigger than our fear." After addressing a crowd of students at the university's student union in an effort to recruit more protesters, they received a notice from the mayor's office threatening arrest should they proceed. After a night of uncertainty, the pair spurred their network of fellow activists to petition the mayor's office. By Wednesday, they told CBS News that a representative from City Hall informed them they'd be allowed to march after all. The demonstration turned into the biggest peaceful protest of the week so far, with thousands of students holding banners. As crowds gathered and huddled around them, Gillespie gave a shout out to the hundreds of high school students there. Said Gillepsie, to cheers: "This is the beginning of a beautiful struggle ladies and gentlemen!" Kevin Harris, a spokesman for the mayor's office, told CBS News: "Baltimore has a long history of peaceful demonstration and what you saw with these kids was them carrying on that tradition. 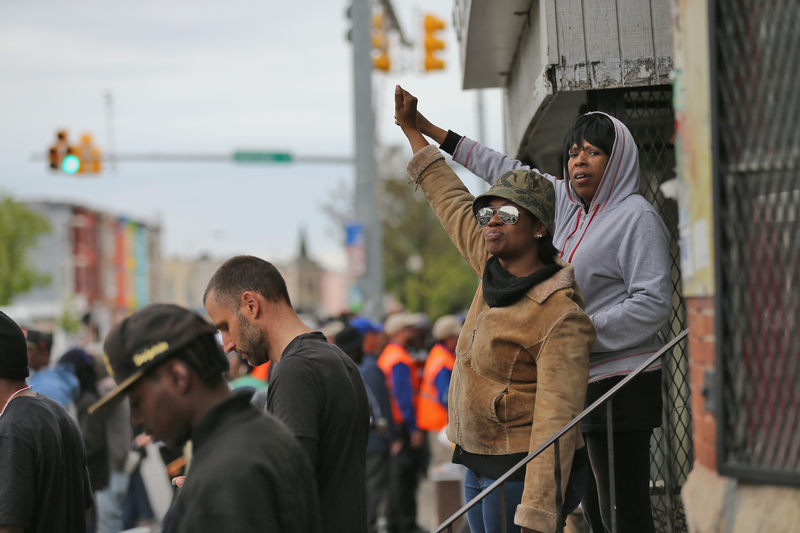 ... What those kids are demonstrating is the very best of Baltimore."